Recent versions of MuseScore have the option to revert back to the standard built-in presets or "factory-settings". This can be necessary if your settings are corrupted. Warning: Reverting to factory settings removes any changes you have made to the preferences, palettes, or window settings. This is not a commonly needed procedure; consult the forums first, as there may be a way to solve your problem without resetting everything. In recent versions it is possible to revert from within MuseScore, providing that MuseScore itself is able to start. 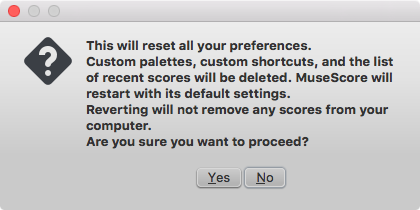 Clicking Yes resets all MuseScore's settings as if the program was installed for the first time, and MuseScore will immediately restart. No will safely cancel the revert. In older versions of MuseScore, or in later versions if they do not start, you must run this process via the command line. Type Windows key+R to open the Run dialog (The Windows key is the one with the logo for Microsoft Windows). Alternatively select Start using your mouse. After a few seconds, MuseScore should start and all the settings reverted to "factory settings". This resets all MuseScore preferences to factory settings and immediately launches the MuseScore application. Note that you cannot quit the Terminal without quitting MuseScore. You can safely quit MuseScore, quit the Terminal, and then reopen MuseScore in the normal fashion, ready to continue using. For advanced users, the main MuseScore preference file is located at ~/Library/Preferences/org.musescore.MuseScore2.plist. The other preferences (palettes, session, shortcuts, workspaces...) are in ~/Library/Application\ Support/MuseScore/MuseScore2/. The following is true for Ubuntu, and most likely all other Linux distributions and UNIX-style operating systems. This resets all MuseScore preferences to factory settings and immediately launches the MuseScore application. You can now quit Terminal, and continue using MuseScore. For advanced users, the main MuseScore preference file is located at ~/.config/MuseScore/MuseScore2.ini. The other preferences (palettes, session, shortcuts, workspaces...) are in ~/.local/share/data/MuseScore/MuseScore2/.